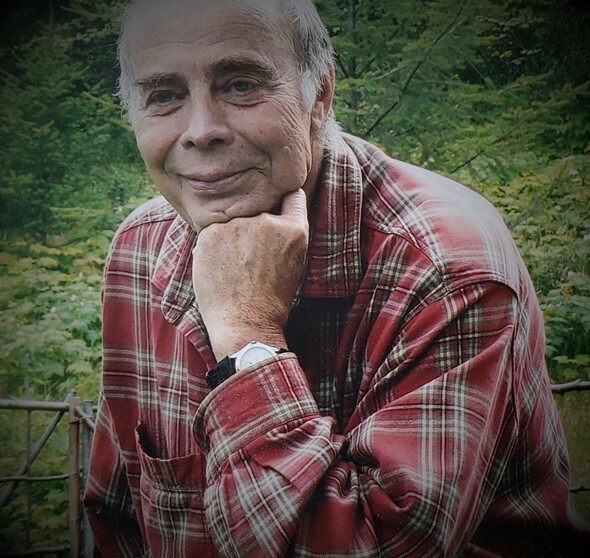 Paul Douglas Andrews, aged 78, passed away in his home in Little Fort, B.C. on March 4, 2019. He was born on August 18, 1940 in Toronto, Ontario to parents Eric Andrews and Ann Schickler. Paul joined the Royal Canadian Air Force at the age of 19, and later became a fighter pilot and Major, and served his country for 34 years. While with the Forces, Paul spent time serving at the Pentagon in Washington DC, and in the Middle East with the United Nations. Paul retired to his log home in Little Fort, where he resided for the past 25 years. He enjoyed the love for music, theatre, and travel. He loved being in nature where he hiked, skied, picked berries, fished, and hunted. He hosted many guests at his home, internationals and locals alike. He was active in the community until recent years, being involved with the Little Fort Volunteer Fire Department and the Community Recreation Society, and for a number of years published the monthly community newspaper, The Little Fort Squawk. Paul is predeceased by his parents and sister Donna McLennan. He is survived by his beloved and loving wife Rosalind of 16 years and her 3 children and 8 grandchildren. Loving father to Shane Andrews, Nicole Andrews, Christopher Loewen, and Simonne Rempel (nee Loewen). Grandfather to Morgan Parker (Nicole); Lucy, Oliver, and Asha Loewen (Christopher); Tyler and Cody Rempel (Simonne). He is also, survived by his brother William Andrews. A Celebration of Life will be held at the Little Fort Community Hall on June 15, 2019 in the afternoon from 2-5 p.m. In lieu of flowers, please make donations in memory of Paul Andrews to the Heart and Stroke Foundation of Canada. Paul was known for his entertaining sense of humor and his storytelling. He was a remarkable and caring man and will be greatly missed for his loving nature and outstanding character. I am so sorry for your loss! Prayers and hugs! Much enjoyed our moose hunting trip at mile 65 1/2 north of North Bay circa 1978 at Franks hunt camp. No moose but lots of good stories and camaraderie. RIP old friend! Such a great loss. He will be remembered always. Love ❤️ to you Nicole, Shane and Morgan. Prayers for you all in this difficult time. It is never the same but different as you move on with your memories. Hold tight to them! Rosalind we are very sorry to hear about Paul’s passing. He will be missed in our little community. Thinking of you ❤️ If I can help you in any way please give me a call. A genteel through and through. Such a wonderful man as you. My heart goes out to Roslind and family for their lose. What a kind and gentle man he was. He always had a smile and kind word. Love and prayers for all his family. Rosalind, We were sorry to hear that Paul passed away, our deepest condolences to all of the family. Paul will be missed in Little Fort. Uncle Paul, you were a role model to us and to our children! You valued family and was one of the kindest people I knew! You welcomed our family into your life and our lives were changed because of what you brought to our family! You will forever be loved! To my aunt Roz, Shane, Nicole, Chris and Simone, thank you for sharing him with all of us! We send you so much love during your time of loss and will continue to keep you in our prayers! Paul will be missed. He was one of the first to welcome me to Little Fort. His “Little Fort Squawk” editions were always looked forward to. I admired his commitment to our community. A great story-teller and a terrific host. Roz, our deepest condolences to you and your families. Our memories are of truly wonderful times at Little Fort and seeing you both in the heart of nature. Paul lived his life to the fullest, making choices in the best interests of mankind and following thru with his talents after retirement. You may all tread in the footsteps he left behind and take comfort from a life well spent. Paul was a very interesting man; we always enjoyed our conversations with him. His kind and gentlemanly ways were a treasure in the fast paced world of today. He will be missed. Condolences to Roz and the family, and prayers for peace and comfort. Like the Cartwrights , the Andrews family made Little Fort a warm and accepting place to visitors. You opened up my heart to its beauty and community. Our sincerest condolences, Roz, to you, Shane and the rest of the family. It’s never easy to lose those we love. Our thoughts are with you. Thinking so much of you these days, Roz. Comforting thoughts go out to you and Shane and Nicole and Simonne and Chris. Paul was a warm, funny, interesting man with a big heart and a wonderful, generous, committed community spirit. I will not forget his daffodils, his annual spring Daiquiri Day, and his hilariously irreverent Little Fort Squawk newspaper. I know you will all miss him. Rest in peace, Paul. Like the Cartwrights the Andrews family made Little Fort a warm and welcoming place to visit. may he join your mother and father on Silvered wings. My uncle has had a profound influence through out my life always giving sound advice and direction to me even though sometimes it hurt. His gentleness and kind ways, reverence for nature and his depth of soul will continue on through all that knew him and were effected by his sage wisdoms. To my aunt Roz (although I have not met you, yet), my cousins Shane, Nicole, Chris and Simone. Leeann and our family would like to express our deepest sympathy’s and remind you that your father lives on with all of us. “its not about what you take with you but what you leave behind you when your gone”. I am proud to be a part of my uncles legacy. An incredible man that will be missed and remembered. My dad Mike Skapa was very close to Paul. I always enjoyed spending time in Little Fort and coming up to your place for a visit, a meal, a hotub, and listen to fishing stories or other projects on the go. Paul was always to very helpful to my dad when he came to Little Fort for the summers. Grateful to have know Paul. And will keep in touch with Roz and Shane. You and Paul were so supportive to Petra’s Dad. Rosalind, I wish I had gotten to spend more time with you.You and Paul, helped to made Little Fort so warm and friendly to visitors. I thank you for all you did to help Petra’s Dad and to help to make Petra’s visits so enjoyable. I also left replies with Anne and Kim Cartwright. May Paul join their mother and father on silvered wings , who also helped to make Little Fort an warm, and caring community. My deepest sympathies to Rosalind and Paul’s children and grandchildren. I had not seen Paul since 1977 when I served with him in the Airforce at Moose Jaw, Saskatchewan, at 2 Canadian Forces Flying Training School (2CFFTS). As Commandant I had the privilege of appointing Paul as Flight Commander of one of the four jet training flights flying the CT-114 Tutor aircraft. All pilots hoping to obtain their wings in the Airforce had to receive their wings on the Tutor at that time. A Flight Commander position was a prestigious one indeed and required the best of our young Majors. Paul was an easy selection for me. He was a very good leader and mentor of his instructors and through them graduated highly successful students who went on to operational training units to fill our squadrons serving around the world. I truly remember today the many personal characteristics of Paul expressed so well by others in the forgoing condolence remarks. Paul was also a good friend. In 1976 Paul had to eject from a Tutor following a mid air collision with another Tutor over Old Wives Lake near Moose Jaw. My wife and I were camping near Banff at the time when, somehow, the Base tracked me down to say Paul was in hospital. My wife and I returned immediately and happily found Paul had parachuted into the lake which, fortunately was only 3-4 feet deep where he landed. He went back flying shortly after his recovery. Paul was a friend to many and a very fine officer and I will fondly remember him. may time heal your sorrow. may friends ease your pain. and may warmest memories remain.